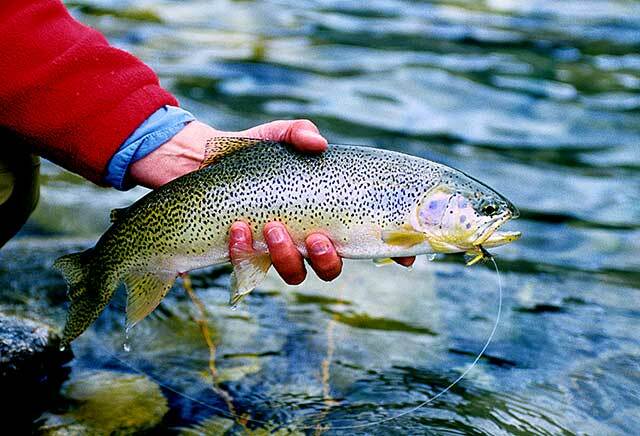 Question: How soon after a trout takes my dry fly should I set the hook? I came across that rule way back, and in general I’ve come to trust it. Now when I find myself tightening on dry-fly fish too soon I stop, and then take a long moment to remind myself to say the phrase before each hook-set. I used to set on dry flies quickly—immediately, in fact—and it lost me fish. The problem was that I’d gotten too good at indicator nymph fishing. If you want success with that method, you tug the hook home as close to the very moment the indicator jiggles or dips as you possibly can, and no later—you simply have to. I really worked at training myself to watch the indicator with a suspicious stare and react in a flash when it gave even the slightest possible tell. I kneaded that response deep into my tissue. So I naturally set dry-fly takes the same way. My childhood of creek fishing didn’t help—the dinky cutthroat trout of those creeks typically shoot for a dry fly like rockets and demand an immediate set. Little trout in general seem to require quicker hook-sets than trout of even ten inches. I gradually came to realize that a 13- or 16-inch brown lazing down shuck-stuck spec-size midges on soft currents is a lousy candidate for a quick set. A tough habit to break, my all-purpose insta-hook-set, and made tougher by the need to take the habit up again whenever I fished an indicator and nymph. Hey, fly fishing’s that way—life’s that way: you adjust. You have to. So I got good at adjusting. And, if you haven’t already, so should you. That leisurely feeding brown I mentioned, the hypothetical one, he’s worth a closer look. Notice that I described the hatching insects he was taking as both tiny (midges, always tiny in rivers) and helpless (impeded by the struggle to extract legs and bodies from shucks), and on quiet currents (where the insects come inching up)—there’s absolutely no reason for this trout to feed with even the slightest urgency and not enough meat in each bug to compensate for the fuel spent in a vigorous take. Trout survival depends on conserving energy: if the bugs are diminutive, helpless, or both, and especially if the water’s delivering them easily, expect a feeding trout’s jaws to work on those bugs in slow motion. Which means, of course, that a longer-than-normal pause before setting a floating fly will likely prove best. Perhaps a “God save the queen and king” or even “God save the queen and king and prince.” You get the idea. I’ve been talking a lot about currents and trout streams, but the God-save-the-queen rule also applies to trout taking floating flies in lakes and ponds: standing water. Normally, just say the stock phrase and set, but caddis adults dart around on top of lakes, just as they do on rivers, to get rushed by trout, and there are also plenty of insects, mayfly spinners that lie dying on the water for example, that trout sip down at a snail’s pace. Again, adjust. Even if you do everything right, by following the Brits’ rule faithfully while wisely adjusting your pauses when trout take floating insects with particular slowness or haste, you’ll get surprises. But then, I already sort of said that (remember my card-game-Vs-math analogy?). Which means, as I also said, you have to stay flexible, open-minded. If “God save the queen” misses three fish in a row, shorten the phrase, and if that doesn’t work, lengthen it. But, because you’re open-minded, you realize that three missed fish might indicate nothing more than the drawing of three consecutive unlucky cards—perhaps you’ll hook and land the next three with exactly the same hook-set pause that lost you the first three. So, just…experiment. Personally, I’m glad that fly fishing is like cards. Each day, each river, each moment, each fish comes out of the deck a mystery. I guess I just like mystery.